Sotheby's, London, 3 December 1997, lot 408. The molding of porcelain was standard practice at Jingde Zhen since long before the snuff-bottle period. Molding allows for easy mass production and is well suited to the manufacture of porcelain. Instead of forming or decorating each individual piece, a carver uses a single mold, from which many identical pieces can be turned out. 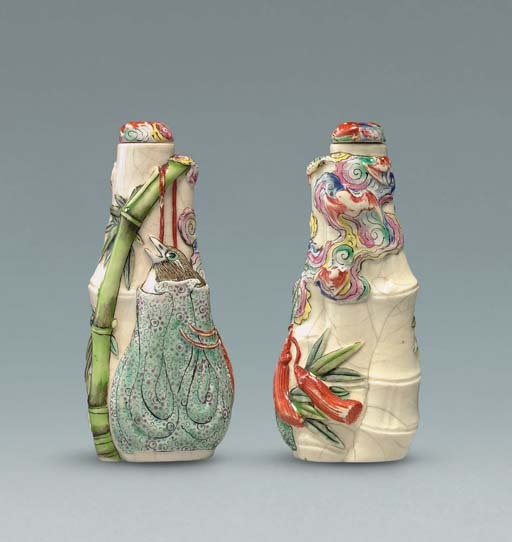 The use of complex molds for snuff bottles, which included extensive relief decoration and dictated the entire form of the bottle, flourished as an art from the late Qianlong period into the Jiaqing reign. The molded decoration on the present lot is unusual and exceptionally detailed. It is also extraordinary that the bottle retains its original stopper. A bottle that was probably made from the same mold, but left undecorated and covered with a monochrome, creamy-white glaze, is in the Bloch Collection, illustrated in Robert Hall, Chinese Snuff Bottles I, no. 64. Only one other example is recorded from this very mold and was in the Hunter Collection.